Environmental services (ES) professionals know the value of highly shined and properly maintained floors. They not only provide a great first impression when the public enters a building, but they also keep building occupants and visitors safer from slips, trips and falls. However, the value and safety that properly maintained floors provide comes at a cost. Some experts estimate that floor maintenance can account for as much as 80 percent of a facility’s cleaning budget. 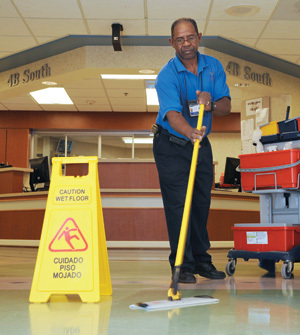 In uncertain economic times with shrinking cleaning budgets, the goal for all ES managers should be to make the most of their time and resources, especially when it comes to arguably the largest expenditure they have — floor care. One of the biggest challenges in maintaining a floor is the outside environment. If a facility is near a coast, sand is the enemy. In snowy climates, the ice melt used to keep the walkways safe can be even worse. But these extremes are just parts of a broad spectrum of things that can destroy floor finishes and create safety concerns. The debris that is tracked into a building from the parking lot causes a tremendous amount of damage over time if not addressed immediately at entryways. It is also imperative that ES professionals routinely address these invaders through a series of routine maintenance steps. In addition to prevention and routine maintenance, several other variables come into play such as floor type and finish, cleaning chemical choice and more. If an ES professional doesn’t have a strong game plan to maintain floors properly, these variables will conspire to increase labor and material costs, leaving a facility with inferior-looking floors that can result in accidents and potential lawsuits. A well-executed, properly maintained matting system. Ideally, all health care facilities will have overhead entryway coverings that block out weather elements before a visitor enters the building. In reality, not many facilities have that feature. Regardless of the protection provided, a basic knowledge of mat types and strategies, as well as a good matting system with a nonslip backing and beveled edges, can go a long way toward keeping floors intact and reducing hazards and costs. Approximately 80 percent of the debris from footwear can be removed after walking over 20 feet of a matting system. If the system is extended to 40-feet long, the amount of soils removed can exceed 90 percent. The biggest bang for the buck in matting starts outside a facility’s doors. Scraper mats come in all sizes and are designed to capture dirt and water from shoes. Scrapers can be made of rubber or different types of woven material and can be placed both inside and outside of entrances. They are big, aggressive defenders of the floor and do the bulk of the dirty work. As big and tough as scrapers are, they can’t do their job if they’re not used right. Well-placed scraper mats should extend past the width of the door opening. The scraper matting system should account for a large portion of the ideal 40 feet of matting. Wet floor signs are a must any time ES staff add water or a chemical to the floor. Once dirt and debris cross the scraper mat, a secondary barrier should absorb residual dirt and moisture that got past the scrapers. A high-quality absorbent or scraper-absorber mat extends the matting system past the scrapers into the first 10 to 15 feet of the facility. It’s important to note that mats aren’t only functional inside and outside entryways. Mats also are an effective way to keep buildings and occupants safe if strategically deployed in kitchens and food-prep areas, vending areas, break rooms, near water fountains and ice machines, and in other high-risk areas, depending on a facility’s needs and priorities. Regardless of where the matting systems are installed or what types of mats are selected, they need to be cleaned regularly. The deep channels in the mats that trap and hold debris and moisture can clog with particles quickly, making the mats almost useless. The matting plan for a facility needs to include regularly scheduled vacuuming and cleaning as well as frequent observational checks by environmental management staff or facility managers. Regularly scheduled floor cleaning and maintenance. Matting systems can certainly remove the bulk of debris that can damage floors and contribute to slips, trips and falls — but what about the portion of debris that is not captured by the mats? Worse yet, what if the mats aren’t cleaned and maintained properly and then become part of the problem instead of part of the solution? Regardless of any cleaning and maintenance systems in place, floor safety and appearance will always boil down to the ES staff and how well they are trained to treat floors. Enough cannot be said for dust mopping with a clean dust mop. Think of grains of dirt or sand grinding into a floor finish like a diamond being scraped across a glass surface. Tiny grains of dirt — or any debris for that matter — are being dragged across floors by unsuspecting shoes and wheels, and scrape the floors all day long. The debris can come into a facility on shoes or can be caused by spills from materials already inside the building. Potted plants, food and drink, paper clips, construction debris and more all collaborate daily to scrape the floor finish. These scrapes scar the floor’s surface, causing the floor to harbor dirt and bacteria in tiny grooves that aren’t easily addressed by dust mopping. Prevention is the key. Truthfully, there should never be a time when an ES worker doesn’t have anything to do. There is always something to be cleaned when ES staff are on the clock. It’s a good strategy to ingrain in staff the idea: “When in doubt, dust mop.” Soil that is addressed quickly will not cause further damage because it will not be transported from one area to the next. Proper use of floor finishes and cleaning chemicals. Dust mopping is only part of the equation. 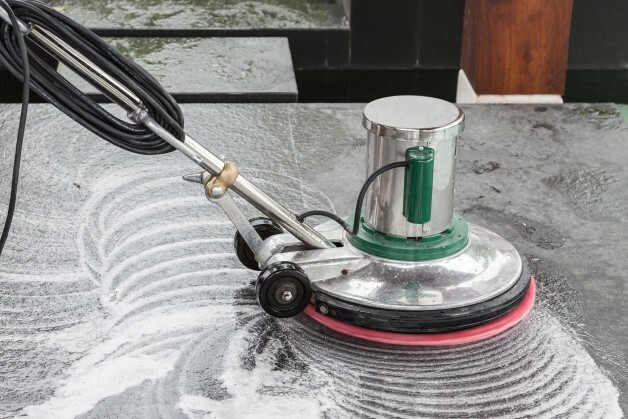 Damp mopping, wet mopping, auto scrubbing, buffing, top scrubbing, stripping and refinishing all come into play at different times and for specific reasons. Wet mopping will remove soils in these tiny floor scars that can darken or yellow a floor finish if not removed. Any time ES staff are doing a procedure that adds water or a chemical to the floor, wet floor signs are a must. Staff also should be trained to remember to return to the area as soon as the floor is dry enough for foot traffic and remove the floor signs or barricades. It is also advisable when stripping or waxing hallways to block off the entire hallway or only do half of the hall at a time to ensure that egress paths are not blocked and safety for all is stressed. Most, but not all, floor types can be effectively cleaned with a simple neutral pH cleaner. Each floor type will have manufacturer-recommended cleaning instructions that will prolong the life of the floor as well as maximize its appearance. In new construction, finding literature published by the manufacturer should be easy because the construction contractor provided it during installation. With existing flooring that can be decades old, the task is more challenging. Experience with floors will give ES professionals knowledge on maintaining each floor type with the correct chemicals. If an ES professional is new to floor care or to a facility, he or she should be instructed properly before performing any floor maintenance. Certain types of cleaning chemicals can deteriorate certain types of floor finishes and cause more harm than good. Along with using the correct type of cleaner for floors, using clean, cool water that is properly diluted is essential. In some ES departments, there is a belief that the more cleaning chemical used, the better. Nothing could be further from the truth. Chemicals not properly diluted can make floors sticky or slippery and will attract and retain dirt, making floors appear dirtier faster. Reading label instructions and using a proportioning system or at least measuring chemicals to the proper ratios is important. The old “glug, glug, glug” method of chemical pouring and measurement isn’t advised in a high-quality floor care program. Staff should be taught correctly and held accountable for their performance. There are no shortcuts. Accountability through proper supervision. Speaking of staff and training, the key ingredient to a high-quality ES team is accountability in the form of good supervision. ES professionals must build a leadership team that is focused on training and accountability. Building a strong team with these values will enable ES professionals to make certain that front-line staff know how to follow prescribed procedures and that the majority of the staff will follow floor maintenance schedules the way they were trained. This will ensure a successful hospital floor care program. The table on Page 46 provides a suggested schedule for high-traffic pattern resilient floors. Putting this schedule into practice will take some trial and error until it is effective for selected floor types and finishes. Implementation of any scheduled floor care program also will be impacted by staffing and budgetary constraints. Whether it’s floor care or basketball, the basics have to be mastered before some of the fancier techniques can be attempted. Mastering these basics before spending money and time on fancier methods or equipment will give ES professionals the ability to fall back on a high-quality floor care program that accomplishes the job efficiently and effectively with limited resources and always stresses safety. Investing in the basics now will pay huge dividends down the road when staffing or budgets become a concern. Brian Tallmadge, CHESP, is assistant chief of environmental management service at Ralph H. Johnson VA Medical Center, Charleston, S.C. He can be reached atBrian.Tallmadge@va.gov.